Discussions about all aspects of technology, what you're doing with it and exchange of ideas and solutions to problems you might be having. As the topic suggests I'm in the market for a new graphics card. I currently have an ATI Sapphire HD 5770 and the poor thing is starting to show the strain these days. Money is no object for this one so I just want your advice as to what represents good value for features right now. Location: At the late night science fiction double feature picture show. I Blame my Mother wrote: Money is no object for this one so I just want your advice as to what represents good value for features right now. HD 7990 with 6144MB GDDR5. Buy two, just in case. If I were to buy a ~£200 card now, it would be the new EVGA GTX 760. There are 10 types of people in the world: those that know binary, those that don't, and those that didn't expect this joke to be in base 3. I've got a GTX660 and it is Rover's danglies! 780 is basically Titan without the huge price, much better value... even owners of the Titan reckon they would of waited if they knew the 780 was due soon. 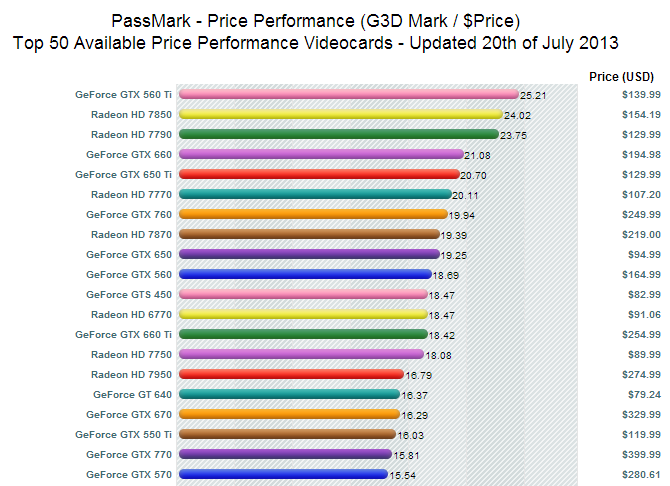 Should say I've a gtx660 in one pc and a hd 7870 in the other.. both fine cards for the money.. If I had the cash though it'd be dual 680's though. I'm sure you've already thought about it but just for the record are you OK for space and PSU if you go for a more powerful card? The 5770 were IIRC noted for low power consumption is mainly why I mention it. "I prefer the company of animals more than the company of humans. Certainly, a wild animal is cruel. But to be merciless is the privilege of civilised humans." I'm not shy for space in my case (though even so I will have the funds to upgrade if needed) and I'm running a corsair TX 650 PSU right now so power shouldn't be an issue I should hope.